How does Creon (Pancrelipase) work? 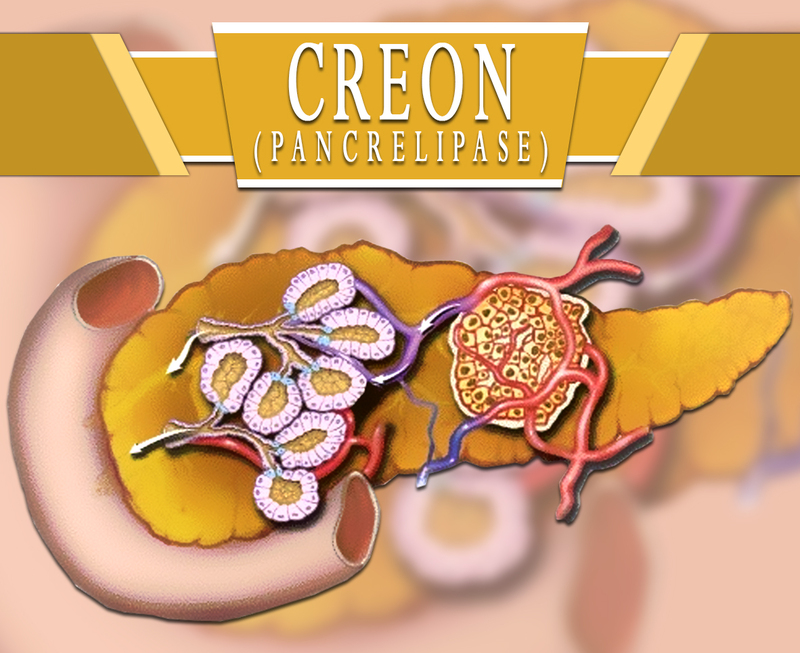 Creon (Pancrelipase) is a pancreatic enzyme replacement therapy (PERT). It works by changing the 3 pancreatic enzymes usually made by a healthy pancreas (protease, lipase, and amylase). Your pancreas usually creates enzymes every time you eat. Therefore, this medication needs to replace those enzymes every time you eat. Creon (Pancrelipase) contains digestive enzymes to help break down and digest fats, proteins, and starch in food. This is a pancreatic enzyme preparation that consists of Pancrelipase. It is an extract derived from porcine pancreatic glands. Pancrelipase has multiple enzyme classes like proteases, porcine-derived lipases, and amylases. This is available as a delayed-release capsule for oral administration. The Food and Drug Administration (FDA) has approved this medication. How to use Creon (Pancrelipase)? The dosage is based on your medical condition and response to the treatment. Creon (Pancrelipase) is usually taken 5 to 6 times per day. It is to be taken by mouth plenty of water. This medication needs to be taken at the same time as food, with every snack or meal. Your doctor will probably start you on a low dose and gradually increase it depending on your response to the treatment. Do not take more or less of it or take more often than the prescription of your doctor. What are the side-effects of Creon (Pancrelipase)? Before using this treatment, let your doctor know if you are allergic to it. Tell also if you have any medical history or current treatments. Pancrelipase may affect your blood sugar if you have diabetes. Check your blood sugar regularly. This medication should be used only when clearly needed during pregnancy. If you are breastfeeding women, consult your doctor first.